From Marvel Comics. The true origin of Thor's archenemy and Marvel's most unpredictable villain! He is the lie-smith; he is the shape-changer; he is the fire that burns. The God of Mischief and Trickery, Loki. Meet the mirthful, beloved young man that made all the Asgardians laugh...until the first time he killed. Discover the gnarled roots of his twisted, unrelenting hatred of the Asgardians. 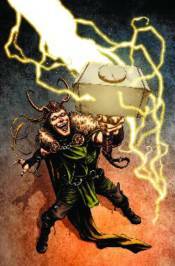 And learn the chilling truth of why he'll never be stopped... Collects Loki #1-#4.